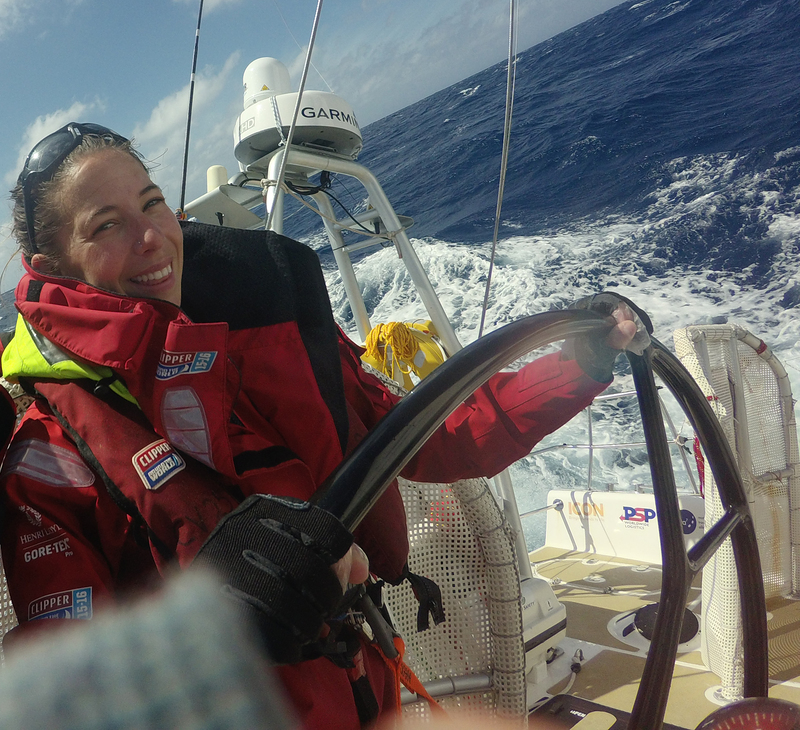 Nineteen years in the making, Da Nang – Viet Nam crew member, Pippa Moore has accomplished her lifetime dream of crossing an ocean and she has done it in style by completing three Atlantic crossings in ten months on the Clipper Race. Pippa’s Clipper Race journey first began when she was eight years old and she saw the fleet depart for the start of its eleven month adventure around the world. She is celebrating her achievement and 27th birthday in Derry-Londonderry, which has provided a warm welcome to race crew with a host of events running during the fleet’s visit this week. Here, Pippa shares her journey so far. Where did your Clipper Race journey begin? I sail with my family and we’ve always had boats sailing in the Solent, I remember when I was eight, seeing the Clipper Race start from Portsmouth. I was sitting with my parents on the boat in my foulies because it was raining and I turned to my Dad and told him that one day, when I was older, I was going to do a leg of the race. There were hundreds of boats on the Solent, it looked incredible, all of the boats were together and there were helicopters flying around, it was so inspiring. A rainy day at home recently I was looking out of the window realising that I was old enough to do it so applied online. I have always wanted to sail across an ocean and wanted to do the first leg having seen the celebration and atmosphere as a child. I signed up for Legs 1 and 2, and I desperately didn’t want to get off so applied for Leg 8 too. The last 8 months have been tough looking at the Race Viewer wanting to be back on the boat. It’s great to be on the final leg, it feels like you have completed the race in its entirety. When I told mum and dad I was finally doing the race they were really supportive and will be in London on 30 July to cheer me in. Why do you want to cross an ocean? I am quite adventurous, I like doing interesting things. I have climbed mountains and love sailing, but I have only done cruising so crossing an ocean is a new experience for me to do something bigger. Racing is an added bonus! The highlight for me so far has to be sailing under the night sky, it’s incredible and on the South Atlantic crossing from Rio to Cape Town there was a total Lunar Eclipse on one of our night watches, it was a beautiful full moon and then a shadow, we didn’t know it was going to happen and it covered the moon gradually until everything went black. Then racing into Cape Town our Skipper Wendy let me helm across the finish line against the backdrop of Table Mountain. I had a little cry, it was pretty momentous for me. What have been your challenges on board? As a sailor the sailing element of the race doesn’t really phase me, you will find me up at the bow, although every now and then I get a bit anxious down below when its rough weather and the boat is noisy with crashing sounds from above. But when you get up on deck, it is never as bad as it seems. Apart from that the mothering makes me stressed because I have to provide a decent meal for 20 plus people. Getting timings and portion control right is essential, making too much or not enough, I don’t want to be responsible for people having a bad meal, it makes such a difference to team morale. What have you learnt about yourself on board? I think generally I am a happy person and I have noticed that on the race I’m pretty optimistic and when people are in a bad mood I always seem to be quite happy and bubbly. I have realised that I am quite hard working, I have grown in confidence too and now know that I can achieve things. We have a happy team and know I can work well with a diverse group of people. Being a nurse, I am used to dealing with people and night shifts, being alert and working through the night, for some crew that is a whole new experience but for me it’s okay and I have handled it well. I’m doing a post grad course at the moment and then after that I would like to move to Australia to work and live. When I’m there I would like to do the Rolex Sydney Hobart Yacht Race, that’s everyone’s highlight on Da Nang – Viet Nam as we did so well. Sadly I wasn’t on that leg so it’s on my list. My long term goal now is to sail around the world on my own boat, that would be awesome. If you are inspired by our courageous crew and feel like an adventure of your own, speak to our recruitment team about joining the 2017-18 race.Click here for more information.